makeART@SPARC - SPARCinLA We are SPARC: Art | Community | Education | Social Justice SPARC | Social & Public Art Resource Center | Creating Sites of Public Memory Since 1976 | Founded by Judy Baca, Donna Deitch & Christina Schlesinger | SPARC is a community cultural center that creates public art as a vehicle to promote civic dialogue, foster cross-cultural understanding, and address critical social issues. We accomplish our mission by producing, preserving and presenting community-based public art. SPARC is a facilitator Ð finding ways to tell richly textured stories that help community participants and artists achieve a measure of change and transformation. makeART@SPARC is a creative workshop series for adults and families in Los Angeles. makeART@SPARC leverages the power of the arts to explore culture, community and social justice. 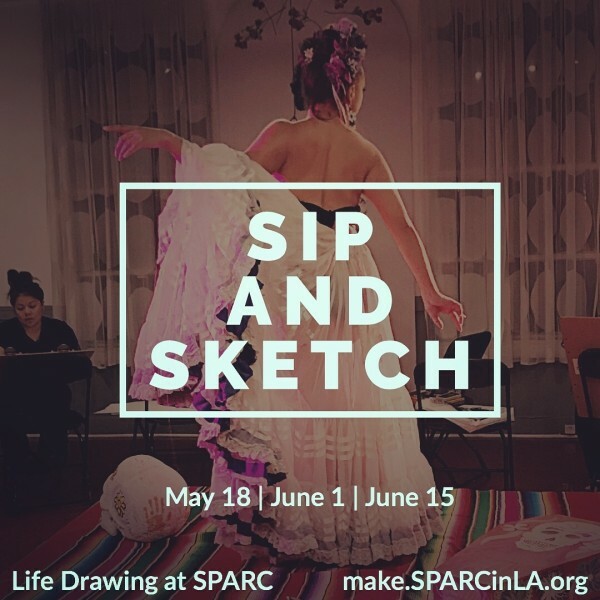 Join us for Sip & Sketch, an evening of art making and wine tasting at SPARC! Sip & Sketch is a life drawing event that aims to reflect the many cultures, identities, and social movements of Los Angeles. Get your charcoal ready to draw some incredible models! All levels of experience are welcome. Each adult ticket (21+) includes two pours of wine. Bring your own drawing materials, or purchase a kit at the SPARC Shop. Saturday, May 18 | 7:00 p.m. – 9:00 p.m. Kinetic Theory Circus School comes to SPARC! We are collaborating with Kinetic Theory to bring two students from their pre-professional program to model for Sip & Sketch. Models will explore contortion, mime, and character work. Artists, illustrators, animators, this is the Sip & Sketch event for you. Special Event! Saturday, June 1 | 7:00 p.m. – 9:00 p.m.
We are kicking off Pride Month and our upcoming Tomboys exhibition with an evening of life drawing that explores the nuances of gender, identity, and intersectionality. Our model, Cynthia Gonzalez, is a poet, Director for CineArte – a Latinx Queer Film and Art Festival by the LA LGBT Center, and Founder of Salvies Who Lunch. Saturday, June 15 | 7:00 p.m. – 9:00 p.m. Something great is in the works! Check back for details soon.